New Delhi: India’s food inflation eased to 4.35% in the year to 3 December -- its lowest reading since late February 2008 -- from an annual 6.60% rise in the previous week, government data showed on Thursday. The primary articles price index was up 5.48%, compared with an annual rise of 6.92% in the prior week. 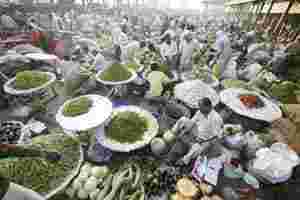 Chief economic adviser Kaushik Basu said on Wednesday that he expected food inflation to drop to 3% within a month. India’s headline inflation has stayed above 9% for a year, despite 13 rate increases by the Reserve Bank of India (RBI) since March 2010. The RBI, which is widely expected to keep rates on hold when it reviews monetary policy on Friday, had said in its October review that if inflationary pressures started to abate by December, more rate increases may not be needed.